The event is locked into modern culture. “When the swallows come back to Capistrano” go the lyrics of a song written in the 1930s that became a popular hit of the time, recorded by the hit group, The Ink Spots, in 1940. The annual return of the swallows is used as metaphor for a reliable, regularly occurring event—like tax day! The bird at the center of this phenomenon is the Cliff Swallow (Petrochelidon pyrrhonota), one species of the group of small, graceful birds that swoop over the landscape catching insects. They are about five inches long, dark brown except for a white forehead and orange-red cheeks. Their head and neck appear iridescent in good lighting. They are common, nesting throughout the United States and wintering in South and Central America. They make mud nests, stuck against a cliff or wall, usually in colonies. The farther west the birds live, the larger their colonies seem to be, sometimes up to a thousand in one group. They gather small pellets of mud from nearby shorelines, building gourd-shaped nests that contain many hundreds of such pellets. Although Cliff Swallows are common, one particular nesting colony has gained an international reputation. 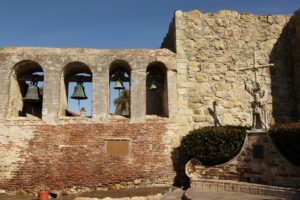 In the southern California town of San Juan Capistrano, the birds have colonized a Spanish mission for hundreds of years. The mission was built in 1776, one of a chain of missions extending down the California coast. An earthquake in 1812 reduced most of the mission to ruins. Ruined or not, Cliff Swallows have long considered the mission their home. Every year, thousands of the birds have made their way from wintering grounds in Goya, Argentina, to this region for nesting—a 6,000-mile one-way journey. In pioneer days, shopkeepers drove birds away from their porches, so the birds moved to the mission. There they found an idea place for nesting. It lies near the confluence of two local rivers, providing an ample supply of mud. The broken down walls provide myriads of nesting sites, with relatively little disturbance by people. The birds arrive in mid-March, and the city has declared March 19, also known as St. Joseph’s Day, the Day of the Return of the Swallows. The annual festival has become a major tourist event, drawing visitors from across the globe. Unfortunately, recent years have not been good for the Cliff Swallows of San Juan Capistrano. When work began in the 1990s to restore the mission, the accumulated nests were removed. Returning birds spread out, looking for other sites—and they found them in the growing development in the area, including the arches of shopping malls and the eaves of nearby homes. For a decades at least, no Cliff Swallows returned to nest in the old mission. The community has tried several strategies to bring the birds back. A temporary wall outfitted with artificial nests was installed, with the hope that it would attract birds to the pre-fabricated homes just like humans moving into a new suburban neighborhood. Recordings of nesting birds are played as another tactic to attract their fellows. The grounds have even been seeded with ladybugs and other insects to provide an attractive food source. In a sense, the whole thing is a miracle. Tiny birds fly thousands of miles between their winter and summer homes. They find an ideal place to build a nest and raise the next generation. It is a miracle that nature reprises in the life histories of millions of species across the lands and waters of our beautiful blue and green earth. And let’s hope that Capistrano’s miracle keeps on happening. Cornell Lab of Ornithology. Cliff Swallow. 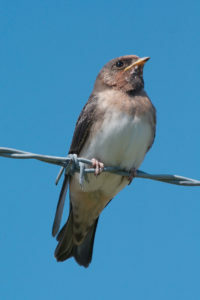 Available at: https://www.allaboutbirds.org/guide/Cliff_Swallow/lifehistory#nesting. Accessed March 18, 2018. Cuniff, Meghann M. 2017. Swallows at San Juan Capistrano were driven away by development. But the birds are slowly coming back. Los Angeles Times, June 2, 2017. Available at: http://www.latimes.com/local/lanow/la-me-swallow-capistrano-20170602-htmlstory.html. Accessed March 18, 2018. Opar, Alisa and Troy Harvey. 2016. A Homecoming for the Legendary Swallows of Mission San Juan Capistrano? Audubon, July 7, 2016. Available at: http://www.audubon.org/news/a-homecoming-legendary-swallows-mission-san-juan-capistrano. Accessed March 18, 2018. Slatta, Richard W. 2001. The Mythical West: An Encyclopedia of Legend, Lore, and Popular Culture. ABCj-CLIO, Santa Barbara, CA. Available at: https://books.google.com/books?id=iczSBcAUC5oC&pg=PA334#v=onepage&q&f=false. Accessed March 18, 2018.